Low-profile steel compensator redirects and harnesses combustion gas energy to reduce felt recoil by as much as 70% compared to an uncompensated barrel. Helps the shooter stay on target for accurate follow-up shots and fast transition to the next target. 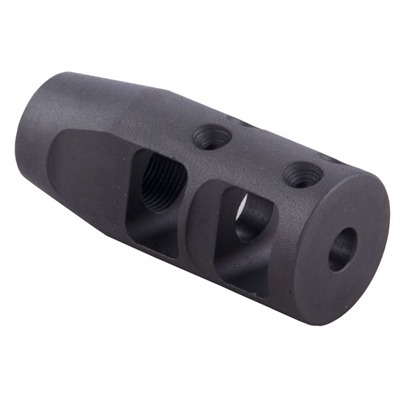 Built to the exacting requirements of noted professional weapons instructor and tactical competition shooter Bennie Cooley to combine the recoil reduction of J.P.’s popular Recoil Eliminator muzzle brake in a slim, streamlined compensator that meets the 1" x 3" size requirements of SOF, WC 3-Gun, USPSA Limited, and other tactical rifle competitions. Large, flat interior baffle surfaces allow the bullet to pass through while redirecting the rapidly expanding gas to the sides and slightly forward through the square-cut side vents to create forward thrust that counteracts bullet recoil. The higher the pressure, the more counteracting force the comp actually provides. In addition, four tuned ports on top minimize muzzle rise, further helping the shooter keep the sights on target. Solid bottom prevents kicking up a dust signature when shooting prone. Precision-machined from high-grade carbon steel, with a tough matte black oxide finish, or stainless steel with a brightly polished surface. All models fit rifles chambered in .223/5.56mm; can be bored out for larger calibers. Standard Profile available for barrels with .750" or .875" O.D. at muzzle. SPECS: Carbon steel, matte black oxide finish, or stainless steel, polished finish. All models bored for .223/5.56mm with ½”-28 threads. .281” I.D. exit hole may be enlarged to fit other calibers. Installation instructions included. Standard Profile – 2-5⁄16" (5.9cm) long, .989” (2.5cm) O.D. Models to fit .750” (1.9cm) and .875” (2.2cm) O.D. barrels. SOF, WC 3-Gun, and USPSA Limited competition legal.